Abstract: Lived experience remains a key concept in qualitative social science research. The study of life-as-experienced is, however, a project that is methodologically problematic due to the fact that researchers can only come to grips with people's lived experiences through their (re)constructed representations of it. Yet, during this process of (re)constructing, some of the complexity of life-as-experienced is inevitably lost. The methodological challenge is to find an approach that embraces, rather than reduces the complexity of life-as experienced. In qualitative research literature, methodological bricolage has been proposed as such an approach. In this article, we present a concrete example of a bricolaged research approach, provide insights into its potential value and reflect on the challenges we encountered. We discuss how our approach enabled a multi-layered exploration of lived experiences. By creatively blending methods, we were able to tap into different kinds of understanding. Our bricolaged research approach generated: 1. knowledge "from within" and "in-between" research subjects, 2. a kaleidoscopic view of lived experiences, and 3. a processual understanding that embraces the temporal dimension of life-as-experienced. Researchers can benefit from our discussion on this bricolaged approach as there are as of yet few concrete examples of how bricolage can be implemented in practice. 4.1 Knowledge from "within" and "in-between"
I've read the Vreewijker a few times now. I mean, we all work together in this project group, but I found the mood of some of the articles about the Groene Vlieger (part of the area), and about what will happen with the million (Euros) from Plasterk (minister), to be rather biased. It's not really the article about the Groene Vlieger, we agree about that, but the tone that we take towards each other. I think: this is not how we (should) sit around the table. And I just feel that this is a boot in the patoot. There will always be bad examples in the Vreewijker since it's written by different people. I am one of them. Sometimes it's rather blunt, I know that, but I mean, we hold back, and we have to agree with each other that we try to have a common line, but then it needs to be clear for everyone that there is a common line and up until now, it has been difficult to find it. I've adjusted the social plan, I will send it to all of you. I've followed the formal requirements of the tenants' association. Concerning the renovation-in-one approach [one of the approaches in the urban regeneration project]: we have done property surveys. There's still five houses to go. We want to start with the renovation activities at the end of October. We will develop a questionnaire to get more information from the people where we have done property surveys. And we also want to develop a satisfaction survey, in which residents can share their opinions about the renovation afterwards. What about the KiB3)? You have put a lot of energy in this, but in practice it seems to be failing. We just started to use it for the property surveys. We haven't used it before. Narrative interviewing aims at generating detailed and vivid stories of experience (KOHLER RIESSMAN, 2006). In our study, the first part of the narrative interview focused on inviting participants to simply tell their story about how they experienced stakeholder relations within the collaborative. To do so, we used a "grand tour" approach (SPRADLEY, 1979, p.86), simply asking participants: could you describe how you experienced stakeholder relations throughout your involvement in the collaborative? This encouraged participants to open up and talk at length about their experiences. Thanks to this approach, we were able to elicit descriptive accounts of participants' "experiential" trajectories concerning stakeholder relations. Below is an example—provided by Helen—of an account elicited through this grand tour approach. Interviewer: Can you tell me about the mutual relations throughout your involvement? How you experienced them? When we felt that participants had finished their "grand tour," we introduced a graphic elicitation tool. We presented the participants with a diagram (see above) and asked them to visualize their experiences. As such, we encouraged participants to make contributions that are more difficult to put into words (also see BAGNOLI, 2009; CRILLY et al., 2006). Below is Helen's diagram, together with explanatory comments she made while drawing it. Interviewer: I want to introduce a tool now, which is actually a diagram. And I want to ask you to draw how you've experienced stakeholder relations throughout your involvement. If you look back to the moment you got involved, up until now, how would you visualize your experiences, just following your intuition? Helen: I do not think that relations were ever below zero, there was also some connectedness back then, but it has grown much stronger now. It has never been negative. The question is if it developed in a straight line [towards more], or whether it goes like this [draws the diagram]. What I do know is that moving to the Vreewijkhuis has meant a lot to me. That was in January 2013. I intuitively feel that the distance has decreased. What also helped was the meeting about the Improvement Program in June 2013. So, relations improved a lot in 2013, but there are still ups and downs. Interviewer: Where there any other important moments? Using the timelines in tandem with the follow-up interview allowed participants to go into more detail and add nuance, and in so doing, to deepen and enrich their accounts (SHERIDAN et al., 2011). However, discussing the researcher-produced timeline with participants also prompted them to reflect upon their previous story and to expand and modify their version on the basis of their new insights (CRILLY et al., 2006). As such, it elicited the dynamic and ongoing nature of lived experiences. 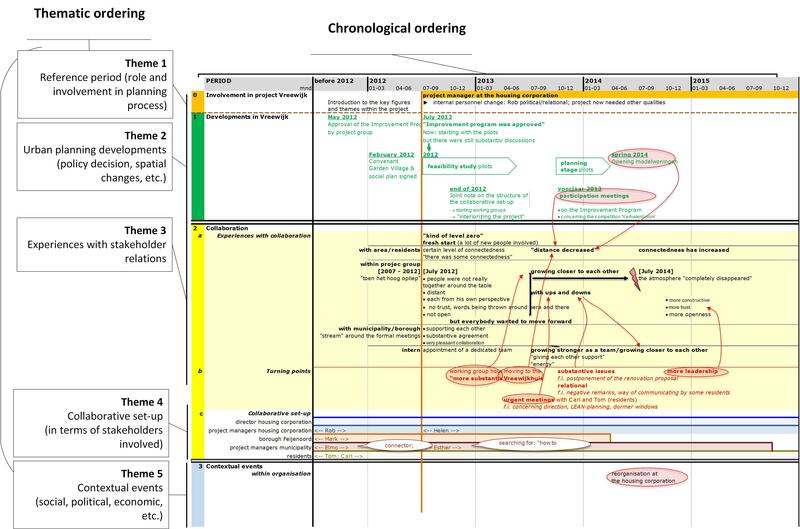 Discussing the timeline also contributed to reflexivity, both for us as researchers and for the participants. We, as researchers, provided insight into how participants' stories were processed, allowing participants to compare this representation of their story with their own ideas. If necessary, they were able to expand, modify or refute the researcher's interpretations (ibid.). The timeline prompted the participants to question and reflect upon some aspects of their initial account. Below, we present Helen's timeline and her reflections and reactions to it during the follow-up interview. Alvesson, Mats & Sköldberg, Kaj (2000). Reflexive methodology: New vistas for qualitative research. London: Sage. Atkinson, Paul (2005). Qualitative research—Unity and diversity. Forum Qualitative Sozialforschung / Forum: Qualitative Social Research, 6(3), Art. 26, http://dx.doi.org/10.17169/fqs-6.3.4 [Accessed: December 12, 2018]. Berglund, Henrik (2007). Researching entrepreneurship as lived experience. In Helle Neergaard & John Parm Ulhøi (Eds. ), Handbook of qualitative research methods in entrepreneurship (pp.75-93). Cheltenham: Edward Elgar. Berry, Kathleen (2006). Research as bricolage: Embracing relationality, multiplicity and complexity. In Kenneth Tobin & Joe Kincheloe (Eds. ), Doing educational research: A handbook (pp.87-116). Rotterdam: Sense Publishers. Bevir, Mark (2006). How narratives explain. In Dvora Yanow & Peregrine Schwartz-Shea (Eds. ), Interpretation and method: Empirical research methods and the interpretive turn (pp.281-290). New York, NY: M.E. Sharpe. Birch, Maxine & Miller, Tina (2000). Inviting intimacy: The interview as therapeutic opportunity. International Journal of Social Research Methodology, 3(3), 189-202. Boszormenyi-Nagy, Ivan (2000). Grondbeginselen van de contextuele benadering [Foundations of contextual therapy]. Haarlem: Toorts B.V.
Bruner, Edward M. (1986). Experience and its expressions. In Victor W. Turner & Edward M. Bruner (Eds. ), The anthropology of experience (pp.3-30). Champaign, IL: University of Illinois Press. Clandinin, D. Jean & Connelly, F. Michael (1994). Personal experience methods. In Norman K. Denzin & Yvonna S. Lincoln (Eds. ), Handbook of qualitative research (pp.413-427). London: Sage. Clandinin, D. Jean & Rosiek, Jerry (2007). Mapping a landscape of narrative inquiry: Borderland spaces and tensions. In D. Jean Clandinin (Ed. ), Handbook of narrative inquiry: Mapping a methodology (pp.35-76). Thousand Oaks; CA: Sage. Crilly, Nathan; Blackwell, Alan F. & Clarkson, P. John (2006). Graphic elicitation: Using research diagrams as interview stimuli. Qualitative Research, 6(3), 341-366. Daher, Marianne; Carré, David; Jaramillo, Andrea; Olivares, Himmbler & Tomicic, Alemka (2017). Experience and meaning in qualitative research: A conceptual review and a methodological device proposal. Forum Qualitative Sozialforschung / Forum: Qualitative Social Research, 18(3), Art. 9, https://doi.org/10.17169/fqs-18.3.2696 [Accessed: December 20, 2018]. Davies, Bronwyn & Davies, Cristyn (2007). Having, and being had by, "experience": Or "experience" in the social sciences after the discursive/poststructuralist turn. Qualitative Inquiry, 13(8), 1139-1159. Denzin, Norman K. & Lincoln, Yvonna S. (1994). Introduction: Entering the field of qualitative research. In Norman K. Denzin & Yvonna S. Lincoln (Eds. ), Handbook of qualitative research (pp.1-17). London: Sage. Denzin, Norman K. & Lincoln, Yvonna S. (2011). Introduction: The discipline and practice of qualitative research. In Norman K. Denzin & Yvonna S. Lincoln (Eds. ), The Sage handbook of qualitative research (5th ed., pp.1-20). Thousand Oaks, CA: Sage. Dickson-Swift, Virginia; James, Erica L.; Kippen, Sandra & Liamputtong, Pranee (2007). Doing sensitive research: What challenges do qualitative researchers face?. Qualitative Research, 7(3), 327-353. Eastmond, Marita (2007). Stories as lived experience: Narratives in forced migration research. Journal of Refugee Studies, 20(2), 248-264. Ellingson, Laura, L. (2012). Interview as embodied communication. In Jaber F. Gubrium, James A. Holstein, Amir B. Marvasti & Karyn D. McKinney (Eds. ), Handbook of interview research (2nd ed., pp.525-539). Thousand Oaks, CA: Sage. Emerson, Robert M.; Fretz, Rachel I. & Shaw, Linda L. (2011). Writing ethnographic fieldnotes. Chicago, IL: University of Chicago Press. Feldman, Martha S.; Bell, Jeannine & Berger, Michele T. (2003). Gaining access: A practical and theoretical guide for qualitative researchers. Walnut Creek, CA: Altamira Press. Gemignani, Marco (2014). Memory, remembering, and oblivion in active narrative interviewing. Qualitative Inquiry, 20(2), 127-135. Gergen, Kenneth, J. & Gergen, Mary M. (1986). Narrative form and the construction of psychological science. In Theodore R. Sarbin (Ed. ), Narrative psychology: The storied nature of human conduct (pp.22-44). Westport, CT: Praeger. Gobo, Giampietro (2011). Ethnography. In David Silverman (Ed. ), Qualitative research (pp.15-34). London: Sage. Greene, Sheila & Hill, Malcolm (2005). Researching children's experience: Methods and methodological issues. In Sheila Greene & Diane Hogan (Eds. ), Researching children's experience (pp.1-21). London: Sage. Hammersley, Martyn & Atkinson, Paul (2007). Ethnography: Principles in practice (3rd ed.). New York, NY: Routledge. Innes, Judith E. & Booher, David E. (2004). Reframing public participation: Strategies for the 21st century. Planning Theory and Practice, 5(4), 419-436. Josselson, Ruthellen (2004). The hermeneutics of faith and the hermeneutics of suspicion. Narrative Inquiry, 14(1), 1-28. Josselson, Ruthellen (2010). Narrative research. In Neil J. Salkind (Ed. ), Encyclopedia of research design (pp.869-874). Thousand Oaks, CA: Sage. Kincheloe, Joe L. (2001). Describing the bricolage: Conceptualizing a new rigor in qualitative research. Qualitative Inquiry, 7(6), 679-692. Kincheloe, Joe L. (2004). Introduction: The power of the bricolage: Expanding research methods. In Joe L. Kincheloe & Kathleen Berry (Eds. ), Rigour & complexity in educational research (pp.1-22). Maidenhead: Open University Press. Kincheloe, Joe L.; McLaren, Peter & Steinberg Shirley R. (2011). Critical pedagogy and qualitative research: Moving to the bricolage. In Norman K. Denzin & Yvonna S. Lincoln (Eds.) The Sage handbook of qualitative research (4th ed., pp.163-178). Thousand Oaks, CA: Sage. Kleinman, Arthur & Kleinman, Joan (1991). Suffering and its professional transformation: Toward an ethnography of interpersonal experience. Culture, Medicine, and Psychiatry, 15, 275-302. Kohler Riessman, Catherine (2006). Narrative interviewing. In Victor Jupp (Ed. ), The Sage dictionary of social research methods (pp.189-191). London: Sage. Kohler Riessman, Catherine (2008). Narrative methods for the human sciences. Thousand Oaks, CA: Sage. Kolar, Kat; Ahmad, Farah; Chan, Linda & Erickson, Patricia G. (2015). Timeline mapping in qualitative interviews: A study of resilience with marginalized groups. International Journal of Qualitative Methods, 14(3), 13-32, https://doi.org/10.1177/160940691501400302 [Accessed: December 20, 2018]. Kramer, Michael E. & Adams, Tony E. (2017) Ethnography. In Mike Allen (Ed.). The Sage encyclopedia of communication research methods (pp.457-461). Thousand Oaks, CA: Sage. Lewis, Susan J. & Russell, Andrew J. (2011). Being embedded: A way forward for ethnographic research. Ethnography, 12(3), 398-416. Mason, Jennifer (2002). Qualitative researching (2nd ed.). London: Sage. Mason, Jennifer (2006). Mixing methods in a qualitatively driven way. Qualitative Research, 6(1), 9-25. McLeod, Julie (2000). Metaphors of the self: Searching for young people's identities in interviews. In Julie McLeod & Karen Malone (Eds. ), Researching youth (pp.45-58). Hobart: Australian Clearinghouse for Youth Studies. Miles, Matthew B. & Huberman, Michael A. (1994). Qualitative data analysis. An expanded source book (2nd ed.). Thousand Oaks, CA: Sage. Miller, Tina (2015). Going back: "Stalking", talking and researcher responsibilities in qualitative longitudinal research. International Journal of Social Research Methodology, 18(3), 293-305. Mishler, Elliot (1990). Validation in inquiry-guided research: The role of exemplars in narrative studies. Harvard Educational Review, 60(4), 415-443. Nowell, Brenda (2009). Profiling capacity for coordination and systems change: The relative contribution of stakeholder relationships in interorganizational collaboratives. American Journal of Community Psychology, 44, 196-212. Patai, Daphne (1994). When method becomes power (Response). In Andrew Gitlin (Ed. ), Power and method: political activism and education (pp.61-73). New York, NY: Routledge. Patterson, Michelle L.; Markey, Melinda A. & Somers, Julian M. (2012). Multiple paths to just ends: Using narrative interviews and timelines to explore health equity and homelessness. International Journal of Qualitative Methods, 11(2), 132-151, https://doi.org/10.1177/160940691201100202 [Accessed: December 20, 2018]. Pederson, Sarah N. (2013). To be welcome: A call for narrative interviewing methods in illness contexts. Qualitative Inquiry, 19(6), 411-418. Pinnegar, Stefinee & Daynes, J. Gary (2007). Locating narrative inquiry historically. Thematics in the turn to narrative. In D. Jean Clandinin (Ed. ), Handbook of narrative inquiry: Mapping a methodology (pp.3-34). Thousand Oaks, CA: Sage. Prosser, Jon & Loxley, Andrew (2008). Introducing visual methods. ESRC National Centre for Research Methods Review Paper, http://eprints.ncrm.ac.uk/420/1/MethodsReviewPaperNCRM-010.pdf [Accessed: December 18, 2018]. Rogers, Matt (2012). Contextualizing theories and practices of bricolage research. The Qualitative Report, 17(48), 1-17, https://nsuworks.nova.edu/tqr/vol17/iss48/3 [Accessed: November 30, 2018]. Sheridan, Joanna; Chamberlain, Kerry & Dupuis, Ann (2011). Timelining: Visualizing experience. Qualitative Research, 11(5), 552-569. Spradley, James P. (1979). The ethnographic interview. New York, NY: Holt, Rinehart and Winston. Taylor, Jodie (2011). The intimate insider: Negotiating the ethics of friendship when doing insider research. Qualitative Research, 11(1), 3-22. Thomson, Rachel & Holland, Janet (2003). Hindsight, foresight and insight: The challenges of longitudinal qualitative research. International Journal of Social Research Methodology, 6(3), 233-244. Throop, Jason C. (2003). Articulating experience. Anthropological Theory, 3(2), 219-241. Tsoukas, Haridimos & Chia, Robert (2002). On organizational becoming: Rethinking organizational change. Organization Science, 13(5), 567-582. Vandenbussche, Lieselot (2018). Mapping stakeholders' relating pathways in collaborative planning processes: A longitudinal case study of an urban regeneration partnership. Planning Theory & Practice, 19(4), 534-557. Vandenbussche, Lieselot; Edelenbos, Jurian & Eshuis, Jasper (2018). Plunging into the process: Methodological reflections on a process-oriented study of stakeholders' relating dynamics. Critical Policy Studies, https://doi.org/10.1080/19460171.2018.1488596 [Accessed: November 30, 2018]. van Manen, Max (1990). Researching lived experience: Human science for an action sensitive pedagogy. London: The Althouse Press. van Manen, Max (2004). Lived experience. In Michael S. Lewis-Beck, Alan Bryman & Tim Futing Liao (Eds. ), The Sage encyclopedia of social science research methods (pp.580-581). Thousand Oaks, CA: Sage. Wagenaar, Hendrik (2011). Meaning in action. Interpretation and dialogue in policy analysis. New York, NY: M.E. Sharpe. Wibberley, Christopher (2012). Getting to grips with bricolage: A personal account. The Qualitative Report, 17(50), http://nsuworks.nova.edu/tqr/vol17/iss25/2 [Accessed: December 20, 2018]. Lieselot VANDENBUSSCHE is a PhD student at the Department of Public Administration and Sociology of the Erasmus University in Rotterdam. She graduated in educational studies from the Catholic University of Leuven. After finishing her studies, she worked as a community worker in a project aiming to engage local government and citizens in participatory and collaborative policymaking. Her PhD research focuses on the interplay between relating and framing dynamics in collaborative policymaking processes. Jurian EDELENBOS is full professor at the Department of Public Administration and Sociology and academic director of the Institute of Housing and Urban Development studies, Erasmus University Rotterdam. He conducts research in the areas of civic self-organization, connective management strategies, and trust and network performance. Dr. Jasper ESHUIS is associate professor at the Department of Public Administration and Sociology at Erasmus University Rotterdam. His research focuses on the governance of urban development, with a special interest in public branding and marketing. His research has been published in journals such as Urban Studies, Public Administration Review, and Public Management Review. Vandenbussche, Lieselot; Edelenbos, Jurian & Eshuis, Jasper (2019). Coming to Grips with Life-as-Experienced: Piecing Together Research to Study Stakeholders' Lived Relational Experiences in Collaborative Planning Processes [50 paragraphs]. Forum Qualitative Sozialforschung / Forum: Qualitative Social Research, 20(1), Art. 16, http://dx.doi.org/10.17169/fqs-20.1.3097.